This pedagogical picture book is a powerful tool in a small package. 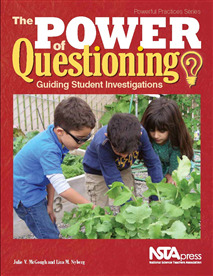 The authors of The Power of Questioning invite you to nurture the potential for learning that grows out of children’s irrepressible urges to ask questions. The book’s foundation is a three-part instructional model, Powerful Practices, grounded in questioning, investigation, and assessment. To bring the model to life, the authors provide vivid pictures as well as links to special videos and audio recordings. You can actually hear teachers and students engage in questioning and watch two easy-to-adapt examples (involving plants and life cycles) of the model in action. Then, you can implement new strategies right away in your own classroom, regardless of grade or topic. Both you and your students will learn how to question effectively, making investigations more engaging. The book also illustrates how to integrate state standards, including the Next Generation Science Standards, the Common Core State Standards, and STEM education practices. The Power of Questioning is a fresh, lively source of strategies both you and your students will enjoy. As the authors—both veteran educators—point out, the elementary science classroom is the perfect place to take advantage of natural curiosity as part of the learning process. Read a sample chapter: Why Does Skill in Questioning Engage Students in Purposeful Standards-Based Learning? Concrete examples and colorful photographs show teachers how to develop powerful questions. A great bonus in this book is a QR code that gives teachers access to video and audio recordings. They show teachers in action using powerful questioning. Also included are resources on the NSTA Extras website. Now you will have help integrating state standards along with implementing NGSS, Common Core Standards, and STEM education practices, too. This book is a quick read, yet the concise style includes all a teacher needs to get started with powerful questioning. What are you waiting for?